As you know (or should know) I am not a fan of paranormal romance so, hey what's with a picture with a dreamy blonde girl with angel wings? Have I fallen to the dark side? What next, posters of a shirtless Taylor Lautner in the study? Modelling my few hairs into a RPatz quiff? Ah, that'll be a no. Firstly, it would take the genius of Vidal Sassoon to do anything with my few follicles beyond the No.1 cut. Plus there's no room on my wall for semi-naked shots of Taylor. They're covered with semi-naked posters of Christain Bale (yes, despite his many moments of madness I stay true. I'm here, Christian! I'll never desert you!). Ehem. Sorry, needed to get that fanboy rant off my chest. Gosh, where was I? 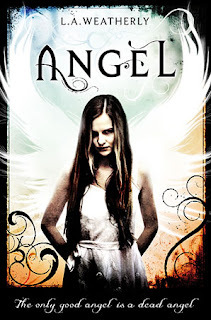 Ah, Angel by L.A Weatherly. But I'll call her Lee, because that's her name. Anyway, Lee's a big hero of mine. Lee teaches writing and she taught me. Now that may or may not be a good thing, depending on which side of the 'Sarwat should go back to engineering and give up this writing lark' fence you may be resting your tush on, but that's a debate for another day. I'm only half-way through Angel and my romance nerves a holding firm, so far we've had a few sidelong glances and a few references to the gorgeous cheekbones of Alex and the petite perfection of Willow BUT we've also had CIA conspiracies, assassinations, brain-washing and religious cults. These are the things that make children's literature so great, don't you agree? But the theme of Angel is the bliss of the bad. Lee's angels are parasites that feed off human auras, but appear as glowing, beautiful beings and leave the victim in a state of euphoria, convinced that the angel has done them good. Instead they are drained, weakened, tainted by the attack. Over time the victim will grow sick and die, never realising it was the angel that started it all. That moment of bliss was the beginning of the end. Because Lee's a proper writer, what appeals to me far more than Willow's blonde locks and Alex's cheekbones is her theme; how we are addicted to things that do us harm. Government warning signs, medical research, our basic instinct, even a glance in the mirror (where did that gut come from? Well, it was a steady diet of burgers and chips all washed down with jumbo Cokes that did it for me) but we do not stop. We embrace the things that destroy us. Wow, it makes you wonder how we've made it as a species, doesn't it? It can't be advertising, half the cigarrette packets are covered with SMOKING KILLS, really, it couldn't be clearer, could it? Mind you, one look at Don Draper with a fag and I want to like up. Check out her book. Then wonder, what's the angel in your life? I haven't heard of this book, but I am all in--sounds great. Jealous you're going to HP world! Have fun!! I don't know if my last comment went through. So I'm leaving another. 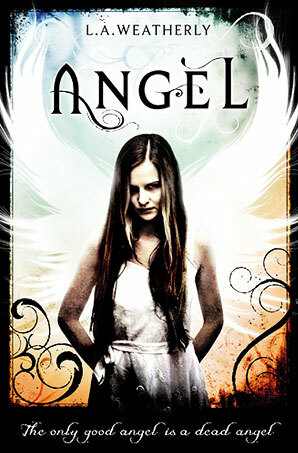 I know Angels' due out in the US but I could get a UK edition posted to you, if you want? All's well but there's one or two things I might want to discuss later. Shall we arrange a chat? BTW, have you any ARCs of P4H2?